Setting: 1960’s America, a time once renown for innovation and progress is now the base for aliens that have invaded earth and have begun to take over peoples bodies, all in the name of invasion. How will humanity ever strike back at such a horror? This slot is from developers Yggdrasil: a staple in the online gaming community, and a figurehead on the Mount Rushmore of online game developers. For more of their games, view online UK slots here! Reptoids is not like your classic invasion slot, you would expect this to be a guns blazing kind of deal, when in reality, this slot is actually one that is set up like a neo-noir espionage slot, tasking you to uncover the truth with spins upon spins. We have only just say scratched the surface here, wish to know more? See below for our full written review. Based in Malta, Yggdrasil is an online game dev company that was founded in 2013 by Fredrik Elmqvist. That name ring a bell? If not then you might need to question why you don't know this person. Fredrik is the former NetEnt CEO which is a massive name in the online slot industry. Now lending his talents in a new environment, Frederick's vision to create new forms of entertainment has seemingly transcended into this new endeavour where the focus is still on player satisfaction with just a pinch of imagination in theme and gameplay: something he is notoriously known for. Learn about online slot games from Yggdrasil gaming! 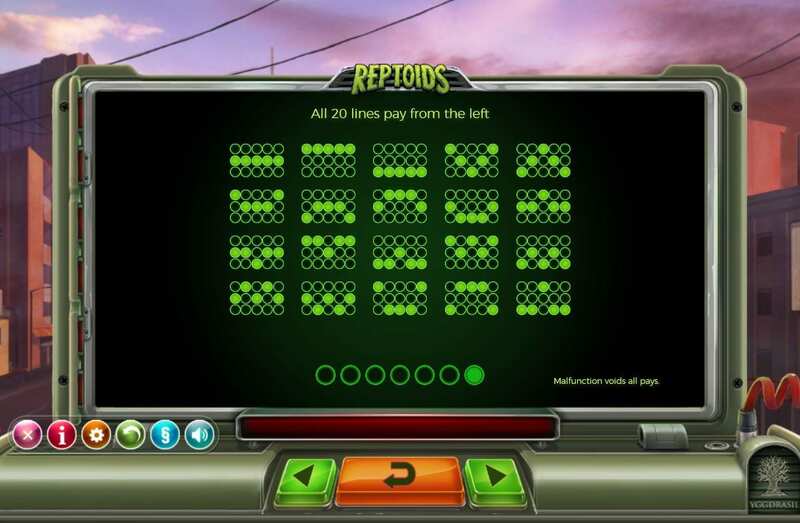 Reptoids is a 5 reel slot that is played across 20 pay-lines, these pay-lines are fixed, making what you see, is what you get. Symbols are matched in the traditional left to right combination, making it rather easy to plan ahead in how you wish to play/strategize moving forwards. If you have played any online slot before in the past then you will no doubt find your footing here. Simply match symbols on the reels and you will win cash, simple. Up to 500,000 coins can be won on a single line which is an incredible incentive to keep playing. Symbols in Reptoids are represented by different game characters/clues that each possess a different numerical value; the more you match the higher the score. Here's a guide on what to play online slot best games for new players. In Reptoids there is an Alien Detector Field bonus round that will scan these reels in search of alien imposters, if found, those symbols will then turn into wilds! This is a very good way of causing some serious harm to these aliens as it will cause them to expose themselves and thus be taken out of the field. Yes there are wilds which means that scatters aren’t too far behind. Scatters will unlock you free spins that can then correspondent into even higher cash pay-outs. See below for our final thoughts on Reptoids.